The 2010-11 season marks the 15th anniversary season of the Wells Fargo Center. Throughout the season, Philadelphiaflyers.com correspondent Bill Meltzer will look back at great games and moments that have shaped the arena’s hockey history to date. The pageantry, stunning skill displays and emotional thrills that mark elite-level international hockey at its very best are best appreciated when witnessed live. In late August and early September of 1996, Philadelphia had the rare opportunity to host three games of the World Cup of Hockey tournament. The tourney was the inaugural event at the brand new multipurpose arena then officially known as the CoreStates Center (now Wells Fargo Center) and popularly dubbed Spectrum II before its unveiling. The tournament, ultimately won by Team USA, proved to be the second most important international accomplish in U.S. hockey history, topped only by the stunning “Miracle on Ice” gold medal victory by Team USA at the 1980 Olympics in Lake Placid. While the decisive game of the best-of-three finals between Team USA and Team Canada took place in Montreal, the new arena in Philadelphia played host to some of the tournament’s most memorable moments, and the various competing teams were heavily represented by then-current or future Flyers players. The victorious American team featured Flyers all-star left winger John LeClair and checking line center Joel Otto. Team Canada boasted superstar center Eric Lindros, two-way center Rod Brind’Amour and top Flyers defenseman Eric Desjardins. In addition, current Flyers general manager Paul Holmgren (then the club’s director of pro scouting) served as an assistant coach on Team USA. Other future Flyers included Team Canada’s Keith Primeau, Team Sweden star Peter Forsberg and Team USA’s Derian Hatcher and Tony Amonte. The following is a look back at the famous USA-Canada game in Philadelphia. 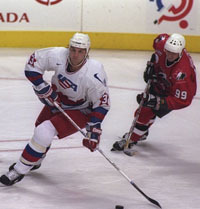 The opening-round meeting between Team USA and Team Canada was one of the most highly anticipated game of the preliminary bracket. The only first-round matches that drew similar pregame excitement were Russia-Canada at Madison Square Garden on Aug. 29 (a controversial 5-3 Canadian victory in which the Russians claimed biased officiating after two goals were waived off and the Russians were called for several penalties) and Sweden’s 5-2 win over archrival Finland at Stockholm’s Globe Arena on Sept. 1. The USA-Canada game marked the official inauguration of the CoreStates center, although the tournament game was actually preceded by an invitation-only free concert by legendary musician Ray Charles on August 12. Upon entry to the USA-Canada game, fans in attendance were allowed to keep their oversized tickets as a fully intact souvenir. 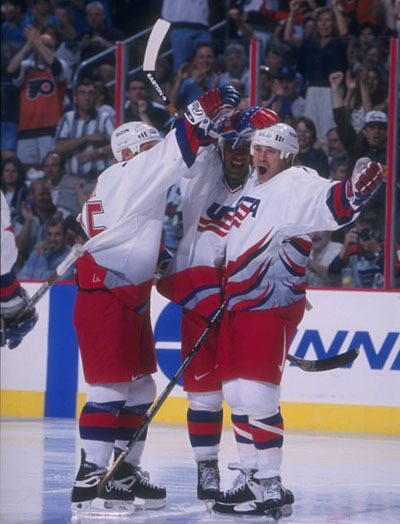 The ticket featured side-by-side action photos of John LeClair and Eric Lindros in Flyers uniforms with the U.S. flag behind LeClair and a Canadian flag behind Lindros. Prior to the game, shortly after fans were allowed to enter the building, Spectacor chairman Ed Snider (who conceived the idea for the new arena, financed it and saw the project through several years of ups and downs to completion) walked around the lower concourse to welcome people, greeting fans and shaking hands. Unlike an NHL All-Star Game, in which players representing the home city’s rival teams are often greeted with boos during player introductions, NHL allegiances were largely put aside during the introductions of the American and Canadian players. The sellout crowd contained a significant, extremely vocal minority of Canadians but the crowd on the whole was partisan to Team USA and would become even more so during the finals. The three Flyers on Team Canada – Lindros, Brind’Amour and Desjardins – were all cheered upon introduction but the response was subdued in comparison to the fan reaction at a typical home opener of the NHL regular season. By far, the loudest ovation for any player on either side was reserved for LeClair. The roars got even louder when LeClair scored the first goal of the game, putting Team USA up 1-0 at the 5:01 mark of the first period. Proving that his success with the Flyers wasn’t merely the product of riding shotgun to Lindros, LeClair played brilliantly throughout the tournament (6 goals, 10 points in 7 games) on a line with Bryan Smolinski and Amonte. 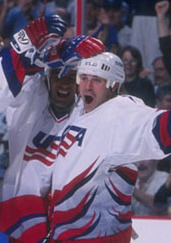 The other top Team USA offensive line consisted of Mike Modano, Keith Tkachuk and Guerin. For Canada, Lindros centered a physically imposing line, flanked by Keith Primeau (later by Joe Sakic after the lines were juggled) and Brendan Shanahan. Brind’Amour played left wing on the third line. The physical play and intensity of the match picked up as the game moved along. Team Canada’s defense struggled to handle the Americans’ forecheck, and the Americans skated away with a 5-3 victory that showed they meant business in the tournament. Unlike the Canadians’ extremely difficult road the finals, the Americans had a surprisingly easy time dispatching in Russia in the semifinals by a 5-2 count. That set the stage for a best-of-three showdown between USA and Canada in the tourney finals, with the first game taking place in Philly and the last two being held at the new Molson Centre in Montreal. In the next two games in Montreal, the Americans skated off with a pair of 5-2 victories to capture the championship. In the third and decisive game, the Canadians dominated most of the action, but Richter single-handedly kept the game close. In a stunning turn, Team USA rallied from a 2-1 deficit in the third period with four goals in the final 3:18. Amonte scored the game-winning goal on the rebound of a Derian Hatcher shot. Derian Hatcher and Adam Deadmarsh added empty-netters in the final minute to create the deceptive 5-2. The building now known as the Wells Fargo Center kicked off the first season of its existence with one of the most successful and exciting hockey events of the last 20 years.